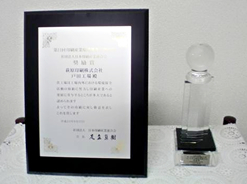 On December 14, 2011, the Offset Printing Department was certified as a “Green Printing Factory” for our headquarters and the Toda Factory at the 22nd Green Printing Factory Certification Session hosted by Japan Federation of Printing Industries. This is a testament that verifies our printing related business is active in environmental management and has achieved the “Printing Service Green Standards,” which are a set of voluntary environmental standards in the printing industry. Since our certified factory produces printed products that use printing materials which comply with the Green standards, those products can use the GP mark display as verification of our general environmental-friendliness. Thanks to our environmental support and improvements to the working conditions, we were recognized for our strong measures that covered production, quality improvement and also security. Hagiwara Printing Co., Ltd. shall actively engage in environmental conservation activities that ensure each and every employee considers the impact on people and the environment. Hagiwara Printing shall identify the environmental impact of business activities along with products and services, shall set environmental targets and goals, shall carry our regular reviews and shall strive to make continuous improvements. Hagiwara Printing shall follow all applicable laws and regulations and strive to prevent contamination. Hagiwara Printing shall strive to carry out environmental conservation measures such as considering recycling measures, reducing waste and reducing its environmental impact such as curtailing noise. Hagiwara Printing shall promote energy-savings and resource-savings and shall strive to effectively use resources. Hagiwara Printing shall strive to develop environmentally-friendly products. Hagiwara Printing shall strive to focus on purchasing environmentally-friendly materials. Hagiwara Printing shall conduct employee training on the environment, and shall strive to raise environmental awareness. Hagiwara Printing shall disclose its environmental approach. Hagiwara Printing shall promote environmentally-friendliness in its “printed products and services” for quotations, receiving orders, submitting proposals and production. The environmental manager shall establish an annual plan, assign a promotion manager and promote environmentally-friendliness. The environmental manager shall regularly (every month) assess and monitor the status of company-wide measures and ensure they are reflected in the plan for the next fiscal year.